More than 200 students from Lake Oswego and Lakeridge high schools joined gun safety advocates and survivor families in Salem on Monday to watch as Gov. Kate Brown signed a bill that aims to prevent convicted stalkers and domestic violence offenders from buying and keeping guns. 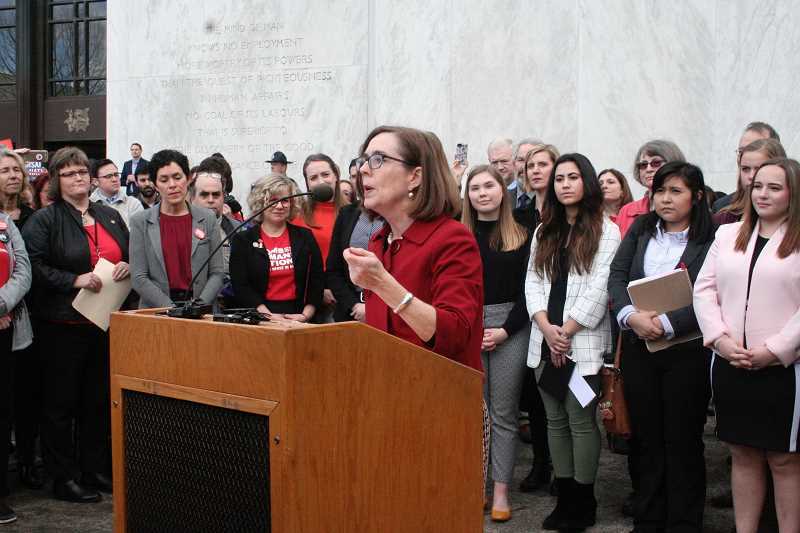 "I'm proud to sign this bill, making Oregon the first state to take action to prevent senseless gun violence since the tragedy in Parkland, Florida," Brown told the group. "Today marks an important milestone, but we know we have more to do. It's long past time we hold the White House and Congress accountable. Now's the time to enact real change and federal gun safety legislation." 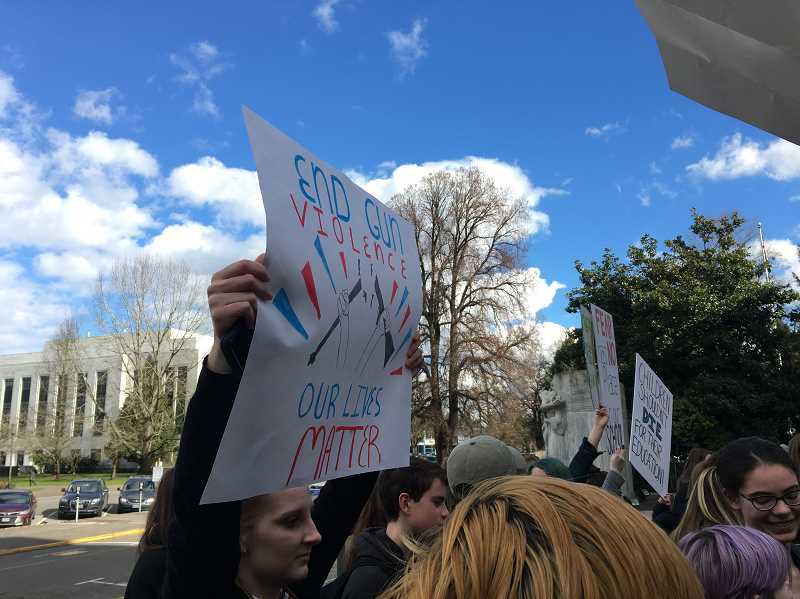 Chanting "I want to live" and carrying signs that said "End gun violence, our lives matter," the Lake Oswego students rallied on the steps of the state Capitol before meeting with Brown. They later met with state Rep. Andrea Salinas and state Sen. Rob Wagner to press their demands for increased school safety, and they also expressed their concerns to a staffer for U.S. Rep. Kurt Schrader. "Being able to team up with Lakeridge and make this a double-sided effort was really powerful," said Lake Oswego High senior Greta Burton. "I think our presence sent a strong message." 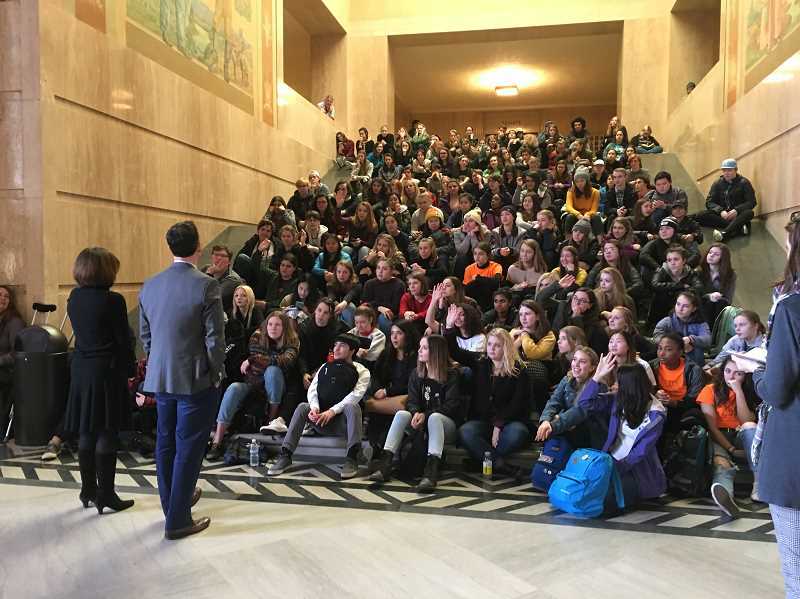 The visit to the Capitol was organized by students from both high schools who have formed a group called Students for Change. Lakeridge sophomore Eli Counce said he was motivated to start the group by the slaying of 17 students at Stoneman Douglas High School in Parkland. "The Parkland shooting was the catalyst for my inspiration. I read heavily about that shooting, and from that read about other shootings," Counce said. "I learned how preventable these tragedies were. I became disgusted at how long it's taken for our government to take large steps to prevent future gun violence in school." The students began their day with a rally on the steps outside of the Capitol. 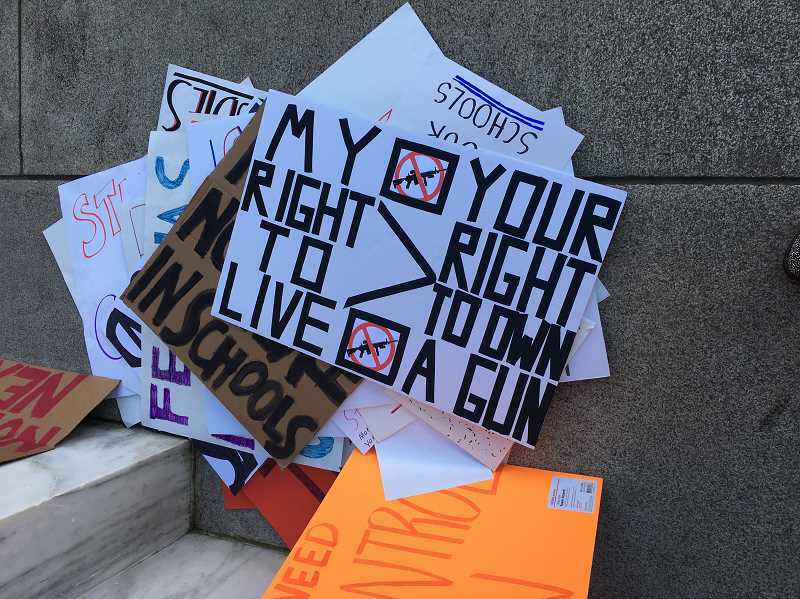 Several students gave short speeches that touched on their frustration with legislators' inaction on gun control, the need for stronger background checks and mental health legislation when it comes to gun purchases, and fears about their own safety at school. Many of the students said they felt the need to take action themselves due to the inaction of those in power. "We count on our elected representatives to look out for our best interests and protect us," said Tatum Miller, a junior at LOHS. "But we needed to take things into our own hands because they weren't taking action. It's time to make a change." Miller said she was particularly motivated by the fear that a mass school shooting could happen anywhere. "I am here because of the fear that I feel going to school. It's not fair for students to feel that," she said. "I've been struggling just to get to school. I sit at my desk afraid because someone could come through the door at any moment and start shooting at me and my classmates." Gathered inside the Capitol rotunda, the students asked a staffer for Schrader a series of tough questions. "Kurt Schrader has a 71 percent approval rating by the NRA," one student asked. "Is that something to be proud of?" When the staffer declined to comment, students said they wanted her to make sure their message was taken seriously by the congressman. "I hope you let him know that he should watch out for us, because we will hold him accountable," one student said. "Oregon is a place of change," another student added, "and we are going to get that change." The students also talked with Wagner and Salinas, who both represent Lake Oswego in the Legislature. Wagner is also a member of the Lake Oswego School Board. "Make sure you stay engaged and never give up," Wagner told the group. "It's easy to get frustrated by the pace of social change, but we need you to continue to make your voices heard." The legislators told the students they support increasing the age to buy firearms, implementing universal background checks and enacting tighter regulations on semiautomatic rifles. "The Second Amendment allows citizens to own a weapon," said Wagner, "but not weapons of war. Automatic and semiautomatic weapons are designed solely for human destruction. We need to start making that distinction." 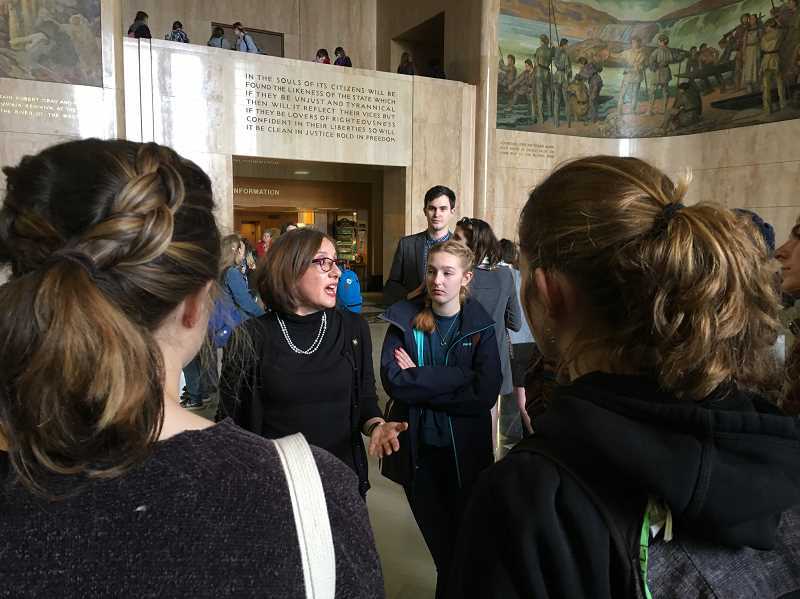 After their meeting with Wagner and Salinas, the students spent a few minutes with Brown, telling her about the steps they'd like to see the state take to end gun violence and improve school safety. For her part, the governor urged students who were already 18 to register to vote. "You want what?" she asked them. "How do you make change?" Brown asked. The group then joined gun safety advocates and survivor families outside to watch Brown sign House Bill 4145 into law. Proposed by the governor, the legislation was arguably the main signature law to emerge from the Legislature's 28-day policymaking session, which ended Saturday. The bill expands restrictions already in place on gun ownership and closes the so-called "boyfriend loophole" — or "intimate partner loophole," as the governor later started referring to it. Domestic abusers who have been married, cohabitated or had children with their victims were already banned from having guns. The bill signed into law Monday expands that ban to dating partners with whom the victim may not have lived or had children. "This loophole needed desperately to be closed, and this bill closes it and protects victims of domestic violence equally," said Doreen Dodgen-Magee of Moms Demand Action, one of the groups that participated in Monday's rally. About 54 percent of mass shootings — those in which four or more people are killed — between 2009 and 2016 were related to domestic abuse, she said, citing research by Everytown for Gun Safety. "Today we are saving lives," she said. On March 14, students in Lake Oswego will participate in a 17-minute moment of silence for those shot and killed in Florida, part of a nationwide vigil that has the blessing of local school officials. Christine Moses, the Lake Oswego School District's executive director of communications, said the district also approved of Monday's trip to Salem. "We are giving students an opportunity to experience the legislative process," she said, "and to learn the skills of persuasion and political advocacy." Counce said community support made the trip to Salem possible, with private donors covering the cost of buses. Parents also accompanied the students to provide supervision. "None of this would have happened if we didn't have such wonderful people in the district," he said. "I love this community, and I hope they know that they're making change possible." To learn more about Students for Change, visit twitter.com/s4cLO or instagram.com/LOstudentsforchange.